I've fallen off the Tuesday Night Vego Challenge bandwagon, not that we haven't been eating vegetarian, just nothing worthy of posting (the culinary equivalent of watching star trek reruns). But today the inspiration has arrived thanks to a tub bursting with baby silverbeet leaves, and a dozen freshly laid eggs. The thought of freshly poached eggs swimming in a vibrant green sauce sounds fantastic today - Saag with Eggs! I started with a recipe from Lil'Chef's World, using red lentils and a slurry of milk and starch instead of cream (because I don't have any). I actually made this for lunch, and it was easily done in half an hour. It's also a great way to get some extra green stuff into your day. Firstly, boil the kettle. If I've learnt anything from Jamie Oliver's 30 minute meals, it's that waiting for water to boil is a waste of time. In a frying pan, heat some olive oil over a medium heat, and add the onion and garlic, cumin and turmeric and tomato. Cook for 5 minutes until the spices are fragrant and the onion and tomato are soft. Add the lentils and a cup of boiling water. Cover and allow to simmer for 10 minutes. While the lentils are cooking, place the spinach in a small food processor/blender or mortar and pestle with a couple of tablespoons of boiling water. You can add fresh herbs. I'm adding some thai basil and mint because I have plenty of both at the moment. Pulse to form a rough puree. Add the puree to the saucepan and reduce the heat so that the sauce gently bubbles. Add the milk, garam masala and season generously with salt and pepper. Finally, crack the eggs into the sauce and allow to poach until done to your liking. Do not stir after you have added the eggs. 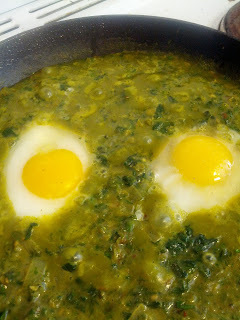 If you have older eggs, then hard boil them and add them to the sauce before serving. Yum. I have all the ingredients for that. The greens are the last of my silver beet - the little grasshoppers of summer are just starting to move in, so it's a great time to strip them.